The first Dalek story to be missing from the archives. Mission to the Unknown is also the only adventure not to feature the Doctor. Instead it revolves around the Space Security Service agents battling the Daleks. Terry Nation apparently intended this episode to be a set up for a Daleks spin off series that was sadly never made. Still I think this episode offers a fascinating insight into what might have been. 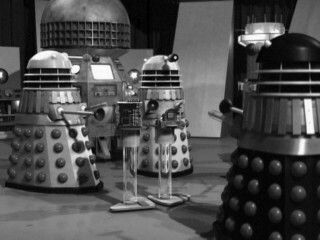 The Daleks are forging an alliance with many other races for unknown reasons on the planet Kembel. The Special Space Security Service sends in its agent Marc Cory to investigate after spotting a Dalek ship near Kembel. Unfortunately Cory’s team are soon attacked by the Daleks new servants the Varga Plants. The Varga’s infect Cory’s team causing them to mutate into Varga’s themselves, and Cory is forced to kill them. The Daleks are also able to destroy Cory’s spaceship leaving him stranded on Kembel. Though Cory tries to send a message back to earth warning them of what the Daleks are planning, the Daleks are able to find and exterminate him before he can do so. 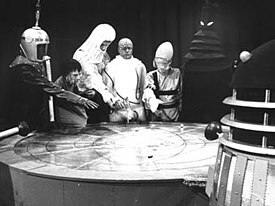 The story ends with the Daleks and their allies plotting to conquer the galaxy and reduce its planets to dust. The first planet they plan to destroy is earth! Malpha/ Now all is ready. We at this table pledge our allegiance to the Dalek cause. Our armies will reduce the galaxies to ashes. Their people to dust. And Earth we will conquer first. Victory! Victory! Gordon Lowery/ It’s the biggest rocket ship I’ve ever seen. It’s like nothing we’ve got. Marc Cory/ It’s from an outer galaxy. Gordon Lowery But what’s it doing in a God-forsaken planet like this? Marc Cory/ I don’t know. But, I’ll tell you this. There’s something very big going on here, and if the Daleks are involved you can bet your life our whole galaxy is in danger. The shortest story of the original Doctor Who series. “Mission to the Unknown” or “Dalek Cutaway” as it is also known is just one episode long. At 25 minutes it is in fact the shortest story not counting children in need specials in the entire history of Doctor Who. As you can expect its not the most nuanced or deep story. Its really more of a trailer for the much, much longer “The Daleks Masterplan”. However despite this “Mission to the Unknown” is still a cracking story. It’s just a fun, action packed adventure full of terrifying monsters, great thrills and tons of excitement. The Varga’s are very memorable monsters and continue a tradition in Terry Nation 60’s Dalek stories where the monsters have a servant race of monsters, such as the lake creatures in the first Dalek story and the Slyther and Robomen in the The Dalek Invasion of Earth. The Varga’s combine the best qualities of all the previous examples. Like the Slyther and the lake mutants they are absolutely disgusting to look at, large, physically imposing, and eats their victims too. However at the same time much like the Robomen they have the power to turn people into members of its own kind which evokes the fate worse than death aspect of the Robomen. The Daleks are also in top form here too. Terry Nation makes up for treating them like doofuses in “The Chase” by not only showing them as scheming, crafty creatures who are clearly from the beginning manipulating their allies, but he also actually has them win at the end. Of course as this story is continued in “The Daleks Masterplan” we know they don’t win for real. Still if you were to watch this on its own it would appear that way, and its still quite a bleak story, with Cory and his team not at any point having the better of the Daleks, and suffering violent and painful deaths. The Daleks many allies are very memorable and colorful creatures too. Though sadly there is only one picture of them that survives, you can still see even from this that they were a very strange and varied group of creatures. Overall this is not the greatest Dalek story, but its still great fun none the less. The Doctor, Steven Taylor and Vicki do not appear, but they are still credited. This is producer Verity Lambert’s last story. The Special Space Security Service that Nation invented for this story were to have originally appeared in Terry Nations Dalek spin off series. This story is sadly missing from the archives, however not only does its sound track still survive, but it was animated by Ian Levine. This animated version is available on Youtube.